Coats, Scarves and Sock Monkeys, Oh My! We have created a NY Cares Coat Drive drop-off at the Church of the Ascension in Greenpoint to make an easy nearby drop-spot for people who wish to donate coats to this good cause. It involves nothing more than people bringing by gently-used coats and they get a tax write-off and everyone feels good and people who need coats get them. 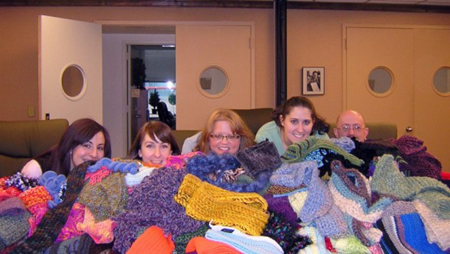 …all in all, we had about 200 scarves to contribute, and tons of yarn for next year! we’re going to keep accepting donations of yarn and scarves for next years baskets. Those are some great looking scarves, folks! Keep ’em coming. I volunteered last night at Fresh Art thanks to your post and link. I had never made a sock monkey before and I fear addiction. What a fabulous group of women and organization. They were all curious how I heard about them and when I mentioned your blog everyone was very interested. I think you have a few more readers. Who says doing something nice for others cannot be fun? Drop off a coat, knit a scarf or make a sock monkey today!